Introduction to the 5 Key Design Trends trend report. In this report we introduce 5 Key Design Trends that in one way or the other will change our future; Cooltural, Rationaissance, Responsibiz, Sensuctive and Breaking Boundaries. We will leave the surface to instead go in depth and relate our design trends to social, economical and ecological patterns and phenomena’s over the entire global – local scale. You can read our reports in three different ways according to your own personal taste. Either flip through the report like a regular magazine (click the magazine to expand it) or choose the pdf version by clicking the symbol below. The third way is just a plain text version. 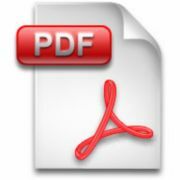 We recommend you to choose to read this specific report either as pdf or flip through because of the rich amount of images. Design is a strong and important process that has a strong influence on society and it can in many ways affect our well being. Design is as well outstanding as a competitive ’weapon’ when it comes to visualising a business strategy. Design is like a bridge between a company and a consumer which can build a trustworthy and reliable friendship (important in a time when advertising has turned into a questionable effort to build brand recognition). Even if design is often about bringing function to our everyday life, it’s also about creating desire. Design can for sure also make savvy costumers pay a premium for an artefact or ingredient. On the other hand, we live in a world crowded by bad design. Of course, within certain limits, everyone is free to produce and sell whatever they like, and boy, they certainly do. Bad design can be seen in everything from graphic artwork to consumer electronics to bad services and urban architecture. The list is never ending… Bad design pollutes our lives, both when it’s around us and after it is thrown away. How did this happen? How may it be avoided in the future? We will leave the surface to instead go in depth and relate a number of design trends to social, economical and ecological patterns and phenomena’s over the entire global – local scale. Because we are firm believers that a design trend is worthless unless put in a social macro perspective. Which effects does design have on our lives, on our future society and cultural movements? How may better and more culturally connected design be created? A bit further on Pandora’s box will be opened and five key design trends, that we believe in one way or another will affect our future, will be presented. But first we intend to talk about why design is so important and how companies ought to work with design issues. So if you want a preview of the future, continue reading and learn about our vision of a, hopefully, bright tomorrow where design plays an important part. Design may, from a company perspective, be defined as “to visualise a strategy”. This means that design is both the process itself as well as the final product or service. Design is hence all about satisfying needs, solving problems and attracting us towards new experiences. Which is the best possible way for companies to meet this, and how shall they work strategically with their design development? This implies that great design often is founded on a social, aesthetical and cultural perspective. Really successful design always looks through the lens of humanity; life enriching products that speaks both to our hearts and our brains. As an entrepreneur you can never forget that consumers are people of flesh and blood with dreams and hopes of good lives. Dare to be different, brake the rules, zag, find the white spaces or the blue ocean. NO matter what you call it, that’s where all of us ought to be. Because in the blue ocean concurrence is irrelevant since the game rules have yet to be set. Despite all of the warnings history is full of examples of products and services that were not sufficiently unique. This makes it crucial to keep an open mind towards the future, to understand the market and its needs. But even more importantly – to have imagination! To think of the future, not yet existing, possibilities. People do not always know what they want. Had Henry Ford asked the people what they needed for transportation they probably would have answered – faster horses. So how may this be done? When it comes to product development it’s important to have a clear design process in order to create products as relevant as possible. But these processes are often limiting and imprisoning. Let’s take the motor industry for instance, it may be very expensive to develop a new car but this has had the unfortunate result that almost all major car companies now days suffer from a lack of identity. Because isn’t it so that cars today look more or less generic? Look back to the sixties and seventies when a Volvo was a Volvo and a BMW a BMW. Even an Opel could be distinguished on the streets. So how is this trap avoided? Perhaps through finding a process that creates order and effectiveness without affecting the creativity. You have to solve problems, deliver to a demand or create new possibilities. You must add magic and relevance. Your products need cultural relevance and they have to evoke meaning. Do not forget the mantra that applies to the development of all sorts of products – differentiation! Think outside the box, open new trains of thought or expand the old ones. During a period of time there as been a fullness and a public reaction against design, both among companies and the public. One of the reasons is the constant overdose from the mass media. Gui Bonsiepe recently criticised that design more and more has “moved away from the idea of “intelligent problem solving” (James Dyson) and draws closer to the ephemeral, fashionable and quickly obsolete, to formal-aesthetic play, to the boutiquization of the universe of products of everyday life.” James Mair from Viaduct furniture in London is on the same track; “The current trend for entertaining design is not problem solving”. On David Report we sadly agree, to a certain degree. Because as well as there are plenty of amazing and creative young designers out there it seems as if there exists a group of designers who put there own ego above the vision of user friendly and desirable design. We actually see quite a significant waste of talent. Successful Swedish designer Björn Dahlström has a clear and set view on the design process; “as a designer you have responsibility for the money of others – you cannot play along”. Also when it comes to this reaction against design we cannot not mention the holistic responsibility that we all hold against our fragile planet and all of our fellow citizens. Josephine Green, Philips Design’s senior director of Trends and Strategy, is just one person that has concerns about the problem of “selling more stuff at a a time when we should be re-thinking stuff”. Designer Jay Osgerby says; “to design fashion items doesn’t interest me at all…”. The essence is that design must be worked with seriously in order to win respect. This applies to designers but above all, producers. Functional design processes, profound culturally connected trend insights and knowledge about human behaviour is paramount. Something is wrong when design in some scenarios has become something viewed upon as a major source of pollution. If the case of design is so strong, why isn’t it being adopted more widely by corporations, organisations and governments? It’s an important question that we soon must answer. Bruce Nussbaum of Businessweek has an explanation; “In the US, CEOs and top managers hate the word “design”. Just believe me. No matter what they tell you, they believe that “design” only has something to do with curtains, wallpaper and maybe their suits. These guys, and they’re still mostly guys, prefer the term “innovation” because it has a masculine, military, engineering, tone to it”. According to us it is also about having a more purposeful perspective, a desire to make a difference. It is also about being educated and to use this knowledge to tell design from styling and decoration…. We have also given a great deal of thought to how the ongoing recession will effect our interest for design, our view on design as well as our need of design. It is for example not unimaginable that we will spend more time in our homes (read our report on Future Luxury) both because of recession and the current instability. Our home will be our fortress, our safe nest that creates a false sense of security against the surrounding world. Home sweet home will once again be a relevant expression. This will in it’s turn affect our need of products and services to be used in our homes. One category that will benefit is electrical gadgets and games. The gaming industry is already huge, it has a bigger turnover than the music industry, and will most likely grow even further over the near future. Those of you who read our spring 2008 report “I shop therefor I am” probably remember that we spoke about the desire to find true happiness that more and more people harbour. Not just the the rife idea of happiness, that is, due to outer circumstances mainly ruled by consumption. Today more and more people voluntarily chose to downsize, and this trend is growing both as a personal choice and because we have less money to spend. British agency Future Laboratory also sees a growing market for products for our homes. Hometailing – retailing for the “homedulgence” generation as they call it. But in their case it is not due to recession but “growth of premiumisation which are creating a new high-end, high-tech, home retail model that requires brands to rethink their attitude to design, delivery, service and personal after-care”. As usual nothing is nor black nor white. How will recession affect the design world and our need of design, according to Faith Popcorn? Read the interview on the following page. Faith Popcorn is an author and founder and CEO of marketing consulting firm BrainReserve. She is a trusted advisor to the Fortune 500 and businesses around the world and an internationally known speaker on consumer trends. Faith, you coined the term Cocooning in the 1990s which described how individuals were about to socializing less and retreating into their home more. You predicted that the ”stay-at-home electronic shopping” should grow. Do you see the same thing happening during the recession this time? Or any major differences? Absolutely, people are taking comfort in the comfort of home. In FPBR’s recently completed Recession Survey (talking to 1011 random and representative Americans online, fielded in June), 72% of the sample found themselves “spending a good deal more time at home entertaining themselves and others.” Of course, what’s different now is that they are being driven to this behavior for pure budgetary reasons, vs. a desire to protect themselves from the harsh outside world. In terms of online shopping, which was really a novel new idea back in 1990; it is now a very mainstream behavior. And while it still has the same advantages: ability to readily price compare, see product detail, read reviews, and so on, what’s really driving it today is the very pragmatic savings associated with a car trip to the mall. How has the upgraded version, Cocooning 2.0 or ubercoCocooning, been affected by the high-speed development of the internet, i.e. we are all more or less connected nowdays, at least in the developed parts of the world? I guess that’s really dependent on what you mean by “connected.” Sure, we all have buddy lists, we have our Facebook friends, we dialogue with our favorite blogs, we read and respond to hundreds of e-mail messages a day; most of us are “always on”, whether on our computers or our smartphones. But is any of this really “connected”? I wonder whether all this “connectivity” is really about erecting barriers to what I’d call “real connectivity”—two or more people, having a chat, face to face, in real time. Electronic connectivity to me feels very different. It’s communication by relay, it defers rather than facilitates conversation. It allows us to filter the information with which we are bombarded every day; enabling us to decide what and when we’ll pay attention, and potentially respond. If this continues, and I think it will, our brains will make genetic bends to regard electronic connections as positive and fulfilling. Shopping has turned into a lifestyle. We are filling our homes with stuff and decoration. Do you see any change in attitudes? Will the recession make us more aware? I’d honestly say, and my own observation, as well as our Recession data confirms, that lifestyle is OVER. Our FPBR TalentBank experts are seeing that even people who have the financial means to spend aren’t doing so anymore—and they find they are feeling really good about that choice. Downward Mobililty is the new direction or Keeping Down with the Jonses; I did without more that you did, kind of thing. You recently brought forward research around patterns in everyday life. Among the different trends, Cashing Out tells us that people feel that their life is too complex, with too little time. How can design make their life easier and more relaxed? I think the answer is in your question—make it easier and more relaxed. Distill it down to the essence, simplify it, strip it. Make it completely user friendly, intuitive if at all possible. Don’t over-package it. I can’t think of an area in design where these principles don’t well match the cultural mindset of today. There will be Restful Resorts wherein we will detox from our over-connectivity. You named another trend 99 Lives. Your research tells us that nearly everyone is considering opting for a simpler life. Four of five (84%) are inclined to buy less stuff; 72% to remove clutter. a. Why do you think we have filled up our homes with things we don’t need? Habit, complacency, a bit of showing off—and some of us are just natural pack rats. The accumulation of goods made up for the barrenness of our Spritual Selves. b. Do you think we will start to buy less but better stuff? Yes, I think we are already seeing that, and I suspect it will accelerate. c. This must also be good for the environment, how can companies make the best out of this trend? Think I’d go back to your last question—make it easy, make it relaxed, make it completely utilitarian. Make it Cheap and provide a service to go along side. If your selling Cereal to Mom, educate her on her Kid’s nutritional Needs or her relationship with her ‘other’. Do you see any major changes in what kind of design we are looking for in the future? What will our preferences be? Again, I think you’ve got in simple and useful and beautiful. Actually, I’ve always been intrigued by a design concept originating in your country—Lagom, ”just enough”. That feels like a very smart aesthetic right now. A couple of years ago you wrote the book EVEolution about marketing to women. Based on the ideas of Evolution, if we change the word marketing to design, how can you make better design (for both sexes) out of this whole brain thinking? –Connecting female consumers to each other connects them to your design. There is something wonderfully communal about the best in design, I think. –This generation of women will lead you to the next. Appreciation of design, one’s “eye” is cultivated and passed on from our elders. –Everything matters—You can’t hide behind your logo. Where did you source your materials; what are your labor practices; what kind of “citizen” are you, beyond your business practices; are you energy efficient in production/in use. As a company, how should you act to get the most out of the current situation (think recession)? Recognize that this is not the beginning of the recession—this is the end of the world as we have known it. Be willing and open to change—everything—because business as usual simply isn’t anymore. Decision making is going to become much more rational vs. emotional; be prepared for that level of scrutiny. Tell the truth. Over-tell the truth. They will discover all you are hiding. Please give me three important key words for design in the future. I would say beautiful, useful and communicative. Which will be according to you the key design trend in the next let’s say five years? Reusable, Sustainable, didn’t hurt anyone/thing to get here. Today most companies understand that the products of their competitors have the same technology, price, performance and functions. To succeed, you have to deliver emotional as well as rational (and tangible) values that differentiates you from your competitors. Producers and designers need to maximize the trail where people seek, understands, accepts and finally sticks with different products. The sticking part is the most crucial. Let us call it affectivity. “Emotions make us buy, whilst feelings make us keep”, says design researcher Kristina Börjesson. “Incredible resources are wasted on objects and products that are thrown long before their physical as well as technical function is over, sometimes even before they even have been used”. Today it is impossible to speak of design without a holistic sustainable point of view. Because what is the long term use with products that we throw away while they’re still functioning? Companies hence has a great ethic as well as ecologic responsibility. As has the consumer. But it cannot only be about striving for a better world, it must also be about self improvement. Companies must make money AND make a difference. “Sustainability, if it is to mean anything, is something we know is not a fashion. It’s something that must be integrated into the DNA of design, not left on the surface. Yet, if sustainability is to be accepted into the DNA of design, and not ultimately rejected as something alien, it must evolve into something that, directly and intensively, delivers value and well being itself to users, citizens, consumers. This bridge, between the constraints of the environment, and the needs of modern humans for expression, creativity, exuberance – life – is the gap that innovative design must bridge”, says sustainability designer John Manoochehri. This is something that designers need to take into consideration. To not design just for the sake of designing, but to keep the producer and later the consumer in mind. Let’s think about this now when we move on to look at the five key design trends that will change the future. We will now look closer upon those five design trends that, in one way or another, will affect how we will design our world in the future. There are both micro sub trends and more global macro trends in between which our five trends unimpededly move back and forth. This for example goes for the debate on sustainable design and how we in a holistic way shall develop it’s efficiency even more. Another trend is the movement around luxury which is moving away from being a monetary concern towards being more knowledge and experience based. Then we have the boosted meeting between design and art (which we named Vulgarism in an earlier edition of this trend report), we have crowd surfing, co-producing, modern heritage, make it yourself, eve-olution, limited editions and…it’s a never ending story. We have consciously chosen not to include these trends separately and instead let them be part of and fuel our five key design trends. Because that is how our world looks like today, a constant mix and fusion of phenomena’s, life styles and cultures. For better or worse….or? We call our five key trends Cooltural, Rationaissance, Responsibiz, Sensuctive and Breaking Boundaries. Unfortunately this anonymity has continued and even escalated during the last two years. The force behind globalisation is strong since big money is involved. Regional and local specialness is erased to, in many cases, never be brought back. But there is change in the making, a light around the corner. We, the consumers, simply do not buy anymore. We want to experience the real deal. It may be the regional or local individuality and the knowledge of who has made a certain product. We want it to have a scent, a taste and a feeling. It’s about time. Where’s the fun in entering yet another Luis Vuitton or Gucci store while in Tokyo? We want to search for the unique, playful and exciting that hides in back streets, beyond the regular tourist traps. Find those things that we may be alone to have. Find products and brands that are honest and tells a story. If the multi national companies wants to be a part of this trend and longing for genuineness they will need to view their clients as individuals with unique, personal needs. Instead of shipping generic products around the globe they should focus on creating a unique profile and a unique assortment on each continent, in each country, each city and why not every block? Because it is on this level that we once again seek inspiration, the unique experience, that which only I and some of my closest friends know of. The barista who makes the greatest coffee in town (without being the most expensive), the hand made piece of jewellery or the unique selection in a vintage store. It is about knowledge rather than money. Folklore and artisan production will see a boost. We also borrow inspiration from traditional local or regional patterns. Think kurbits, the local pattern from Dalarna in the north of Sweden, applied and used in novel ways. COOLTURAL is also about how we through methods like ReUSe and ReMix reutilise things in other ways, without for that sake hiding its origin. Patina will once again be important. And also updating ancient traditions. Above all COOLTURAL is about storytelling and authenticity. Cultural nomad Satyendra Pakhale, who is originally from India, has developed a ceramic product which takes regional cooking tradition into the 21th century, with a preserved feeling of localness and history. This makes it humanistic and easy to understand. This type of products have, despite of their local origin, a global comprehension. This kind of symbolic products are definitely an interesting way forward and new grounds to explore for the mass-market industry. Another designer who we think really succeeds in adding feeling into her products and interiors is Ilse Crawford. Her recent interiors for Stockholm Grand Hotel restaurant Mathias Dahlgren and classic british pub The Olde Bell Inn are good examples. Yet another good example is belgian clothes designer Martin Margiela and his shops. They all have a unique concept, suited for each location. In Paris the theme is “hotel” and this, in combination with the highly individual and personal design of the clothes has created a boutique completely free from the stuck upness so common in the world of luxury fashion. Here you get the feeling that anything is possible and that you share the experience only with the lucky few who find their way to the shop. The Paris store even has a stage, set with microphones and sound systems. At any minute you expect to see Paris based indiepop duo CocoRosie. Commes de Garçons guerilla stores are based partly on the same principal. Super brands of the world still have a lot to learn. It’s about daring to let go but above all to offer a unique experience. This may be described as a search for a mythic talisman. The RATIONAISSANCE trend springs from design history. But it’s at the same time (and perhaps because of that) a trend for the future which in a liberating way rebel against the dictates of modernism and minimalism. In a way design is about merging the past, present and the future. If we fail in doing so it all becomes rather dull because of the lack of history. RATIONAISSANCE is about going beyond the short term and fleeting trends. As our key words shows RATIONAISSANCE is about functioning and often rational things that at the same time are stylish and iconic. Especially the iconic bit is an important distinction. Because, really, what is an iconic product? The word timeless captures it nicely. It can travel through space and time, and hence overcome time. We could also describe it as to “age with grace”. To us this also makes it ethical (if it is at all possible for things to be that). RATIONAISSANCE is about the things that we keep for a long time, that even may become a heritage. We are pretty much clear with what iconic products throughout history looks like, but what about the future ones? Imagine if it was possible to figure out a formula to create these kinds of objects, and make producers strive in that direction? As a reaction against our wear and tear society. This is our attempt to a definition of a timeless product; a product that clearly reflects its time at the same time as it stretches the limits of technology and production methods. Simple as that…Apply this definition to design classics as Ant chair by Jacobsen, Wassily chair by Marcel Breuer and The Panton chair by Werner Panton. It works quite well. The style that RATIONAISSANCE represents is thought through and sufficient. It dares to be contemporary. It’s positive and not rarely playful and colourful in all its simplicity. It is economic in resources. The trend balances the simple with the sophisticated and the discrete with the bold. Quite simply products that are easily understandable, easy to use and to have a life long relation with. We need these kinds of companions in a world that is more and more complex. Apple is a company that works closely with RATIONAISSANCE’s keywords; stylish, functional and iconic. Their user friendly interface and attractive products puts them way ahead of their colleagues and competitors. That’s why Apple can pride themselves with having dedicated brand fans who’s lives depend on the latest products or updates. It’s worth to mention that Apple, trough designer Jonathan Ive, borrows quite friskily from books throughout history and hence unites past, present and future. This is probably one of the reasons to their successes, since it adds a historic relevance to the products while they’re also in the absolute front line with their intelligent compatibility. A fast comparison with Dieter Rams products for German Braun from the fifties and sixties reveals several clever design borrowings. This is a great example from the design world of what is referred to as “convergent evolution” by biologists. In this case as a homage and recycling of classic products. • Good design is innovative. • Good design makes a product useful. • Good design is aesthetic. • Good design helps us to understand a product. • Good design is unobtrusive. • Good design is honest. • Good design is durable. • Good design is consequent to the last detail. • Good design is concerned with the environment. • Good design is as little design as possible. Japanese designer Naoto Fukasawa is one of the leading and most celebrated product designers of today. He has that something special that gives his products a personal typography. His own brand plusminuszero presents a number of home electronic products that by their shrewd ingeniousness differs from everything else. The wall hanged cd player for Muji is another example. British designer Jasper Morrison recently made this statement about Fukasawa; “I have the strange sensation than Naoto has gone through some kind of barrier, that he thinks in a world that hasn’t yet arrived for the rest of us. The objects in his world are unlike the objects in ours”. In architecture good examples of RATIONAISSANCE are culture house Sfera building in Kyoto, Japan by Swedish trio Claesson Koivisto Rune as well as the New Museum of Contemporary Art by Japanese bureau Sanaa. The later museums lower-level hallway by Jeffrey Inaba uses a radical approach to research and design to make opaque information come alive by using a bold, immersive graphic environment that identifies and quantifies public and private philanthropy around the world. Designers that represents RATIONAISSANCE includes above mentioned Jasper Morrison, Naoto Fukasawa and Claesson Koivisto Rune but also the Bouroullec brothers, Sam Hecht and Konstantin Grcic to name a few. Let’s listen to Dieter Rams again; “I believe designers should eliminate the unnecessary. That means eliminating everything that is modish because this kind of thing is only short-lived”. Sometimes we simply need LESS. The forces of the market constantly tries to seize our attention. A recent study shows that an average urban citizen is subject to as many as 3000 personal brand trespasses daily. No wonder that we now and again need to rest our eyes on something subtle, that we want things that work, that we can understand and that speaks to us in a low, subtile voice. The quarterly economy will hopefully get a brand new driving force. But one mustn’t play tricks with these issues. It’s crucial that the social responsibility communicated by companies is a well integrated part of their soul and DNA. Because the world we live in is more or less transparent, secrecy is officially declared dead. “Don’t bother trying. You’ll just look like a jackass when your secrets are leaked and your lies are exposed” as writer Clive Thompson puts it. There is a word that explains the act to try to make money out of peoples desire to do the right thing; greenwashing. John Thackara from Doors of Perception recently wrote this about greenwashing: “In business, green washing often means changing the name and/or label. Early warning signs that a product is probably toxic include images of trees, birds, or dew drops. If all three are on the box, the product will probably make your skin peel off in seconds”. The transparent world has been born through the rapid technologic development and the possibility to communicate fast without being limited by time and space. Today we’re, in the developed parts of the world at least, more or less totally connected and globally networked. RESPONSIBIZ is, besides an awareness of peoples needs and global fairness also about reducing the affects on the nature surrounding us. British “think and do” tank New Economics Foundation recently made the prophecy that we only have a hundred months to change the course of development, and then it will be too late. Even if this may be rejected as atrocity propaganda it certainly should awake a few thoughts. A company which in an interesting way works for global fairness is Swedish Peepoople who with their life saving Peepoo bag has made a really interesting innovation. It’s a personal single use toilet, that sanitise the human excreta shortly after the defecation, preventing the faeces from contaminating the immediate as well as the larger environment. This is an extremely useful product, every 15 seconds a child somewhere dies due to contaminated water. Danish Index award have during several years rewarded the types of products that makes a difference. An interesting product that has been awarded is LifeStraw, a personal mobile water-purification tool is designed to turn any surface water into drinking water. We have earlier pointed out the importance of having a holistic view on the term sustainable design. We say it’s important not to trivialise it by equalising it with the choices of materials and such. As we earlier mentioned it is very important to dare go in depth and appreciate the value of affection, authenticity, aesthetics and compatibility and their long term effects on the durability of a product. How may companies increase the life length of their products? Vintage and second hand shops are of course one way. Finish furniture producer Artek has conceptualised the thoughts around re-duce and re-use further through their project 2nd cycle. They quite simply buy old Aalvar Aalto products and put them back on the market. By creating the concept Artek wants to raise the discussion of conscious consuming, praise the authentic design and honour the importance of originality. The dints, the scratches and the patina tell their never-ending story. A coded RFID tag embedded in each 2nd Cycle item records the furniture’s history, stories, as well as information about its origins. The tag can be read by mobile phone, revealing an internet link to the particular item’s history, allowing also new owners to upload their own stories. The found the following text in the ’Iittala philosophy; ”Have you noticed how easy it is, in our shopping-oriented world, to crowd your home with meaningless things? You find yourself with short-lived items that eventually cease to function, or go out of style. So they are thrown away, adding to the growing mountains of unusable rubbish on our planet, while you keep on shopping for new things. For a long time, Iittala has been part of an ongoing revolution. This is based on the belief that all human beings can make conscious choices in everyday life. Choosing objects that will last in design and quality will please our senses and create harmony in our everyday lives. Fortunately, this is also a choice for a more sustainable society, and against buying short-lived things destined for the rubbish bin. To do the right thing will in the future much more be about strategical business. You must have clearly visible social and moral values or no one will buy your offer. This will also affect which types of products and services will be developed. Being holistic and not strain our finite resources wont suffice. These attributes are already becoming generic. The types of products and services we will see more of in the future will more visibly benefit both humans and the society at large. A great example is New York based designer Stephen Burk’s works with American producer Artecnica and nonprofit organization Aid to Artisans in South Africa and Peru. The award-winning Design with Conscience product line by Artecnica reintroduces traditional craft into the high design landscape. Each piece in the collection is a collaborative effort art directed by Artecnica, conceptualised by renowned international designers, and handcrafted by artisan communities across the globe. What is especially interesting with this way to work is the contribution to a local change, and that it’s not just charity. It’s simply more modern and a far more sustainable and long term method. The need for design that seduces us by appealing to all of our senses is constantly increasing. SENSUCTIVE is about design for human desire and pleasure. In a world ruled largely by technocrats and technological winnings it sometimes seems as humans are irrelevant pawns in a bigger picture. Therefor we want to be seen, we want to feel with our entire bodies. We seek experience based emotional design. Design that sometimes borders to poetry, design that opens new doors and and gives us sensory experiences. Design that brings us intimately in touch with ourselves. It’s all about self awareness. Many long to once again connect to the important rituals and ceremonies of life that connect us to our history. At the same time as we are receptive we would like to be able to share. SENSUCTIVE is about personality, the small format, naked and natural. Not the universal, but the small and special moments that makes life worth living. This is when we are in touch with our senses. Intimate moments when we’re living life to its full. Design based on the SENSUCTIVE trend flirts with our dreams. One example is the Paper forest by Petra Eichler & Susanne Kessler for Dutch company Droog, with sound and light that invites our thoughts to wander off. Japanese design group Nendo’s clothes hanger that seems to be made out of plant vines also speaks to our subconscious. The entry to furniture brand Moroso’s showroom during the Milan design week also communicated to our senses with its cold, dark rain and obscure blue light. While speaking of experiences we cannot forget to mention artist Olafur Eliasson that has reached fame for his multi dimensional installations, seen across the world. One example is the on going The New York City waterfalls. They are a nice experience, but we would like to turn the clock back a couple of years and mention his Weather Project, which was a remarkable installation at Tate Modern in London back in 2003-2004. It was a strong and special experience and drew attention to the fundamental act of perceiving the world around us. When David Report talks about design, brands, art and so on we always state that a true cultural connection is paramount. The Weather Project definitely had that! SENSUCTIVE is also about feelings and personal moments. It’s about our memory and thus also about affectivity. Ceremony and rituals helps us understand and explore the world. SENSUCTIVE is low-tech and globally understandable, it’s humane and it connects people, which is why it is so important. Italian designer Paula Navone creates humanistic interiors and objects with a distinct emotional and original feeling. She’s a master of patina with history. She rediscovers design from the past and brings it to life in new, contemporary forms. As a citizen of the world: driven by her extreme interest in the most widely differing cultures, she tells stories about the essence of the material. Paola Navone brings forth a feeling that takes the experience to another level. It’s the charm in the combination of old and new. She is trying to provide warmth and awake memories of previous experiences. The restaurant Pane e Acqua around the corner from Spazio Rossana Orlandi is a good example of her design. The SENSUCTIVE trend also borrows inspiration from nature and its built in mystic. Picture frost nipped winter apples on a lawn, or the foggy morning on a meadow. But it’s also about the city and it’s multi facetted content. We quote Charles Baudelaire; “The life of our city is rich in poetic and marvellous subjects”. Ilse Crawford was mentioned earlier in this report. We cannot not show her lamp w08, produced by Swedish newcomer Wästberg. With its special material combination it distinctly differs from the main body of newly produced lamps. According to Ilse w08 is also more than just a lamp, she sees it as a friend and a companion in the night. This is how she describes her thoughts on the material generally; “Materials have hidden messages. These create a powerful link to our emotional psyches and shape our connection to daily life”. 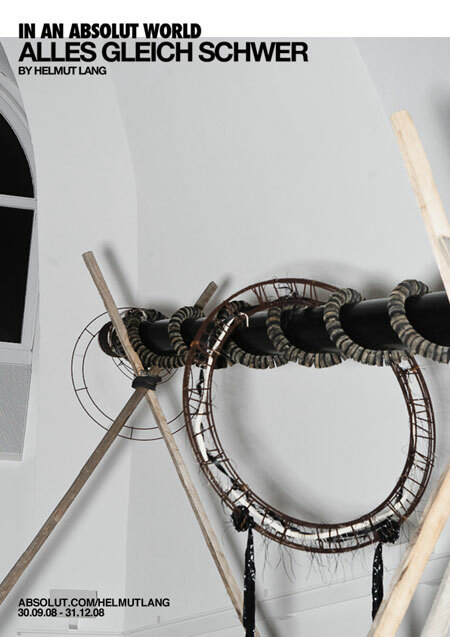 By the way we like lamp producer Wästerbergs manifesto; “lamps for offices, hotels and caves”…. Spirituality is no longer just something for the New Age communities but is about to become a centre part of the mainstream cultural awareness. Mind, spirit and body are central. We will see more and more products that has an added spiritual value. This will of course influence design as a phenomena at large. This types of product will definitely appeal to LOHAS (Lifestyles of Health and Sustainability). This target group describes an estimated $230 billion U.S. marketplace for goods and services focused on health, the environment, social justice, alternative transportation and energy, green building, eco tourism, personal development and sustainable living in general. It’s not only about striving for a better world, it’s also very much about self-improvement (never forget that!). BREAKING BOUNDARIES is about breaking new ground. About being proactive. In the big picture this could of course be the particle accelerator built by Cern in Switzerland to, if possible, recreate the Big Bang. In other words something founded on new technology and and technical developments. But not necessarily. It can also be about new materials, but also other things. We think this trend will go beyond the surface and go in depth, below the physical materials and walls and develop design also on a psychological level. Over all BREAKING BOUNDARIES is mostly about a transformation between different anti poles, such as local/global, technology/philosophy and body/mind. Cultural nomad and designer Satyendra Pakhale puts it like this” Design is a universal poetry, it’s not a profession, but a way of life.” His design philosophy is based on transformation and linking. Both when it comes to accustomed ideas, moral or completely technical aspects. It is thus about daring to take that step into the unknown. Satyendra tries to merge industrial design with the natural world, the technological with humanistic, the ancient with the contemporary, the physical and emotional with engineering. This ground-breaking design will be important in the changing of our world and the improvement of our future. A new way of thinking is needed. A way of thinking that can make a difference. That has the ability to combine high and low, north and south, east and west, the metaphorical and the concrete. Author Frans Johansson talks about the Intersection. A place where wonderful and extraordinary things can happen. Explosions of creativity. We see a lot of hybrid cars today, but what is the connection between termites and architecture? Frans Johansson brings forward an interesting example of an energy-saving building in Harare, Zimbabwe which was developed by architect Mick Pearce with an interdisciplinary approach. His idea was to get rid of any need for air conditioning. This in a place where temperature changes dramatically during the day. His passion for understanding natural ecosystems made him design a natural ventilation inspired by termites and how they cool their tower like mounds of mud and dirt. According to Frans Johansson “people who can step into an intersection of different fields or cultures are those who will change the world.” We agree! Another example is reputed Spanish restaurant El Bulli, situated in Cala Montjoi about ten miles north of Barcelona. El Bulli has, through chef Ferran Adria’s lead, become one of the worlds most experimental and avant-gardist kitchens. They have with their molecular gastronomy brought cooking and restaurant experiences into the future. The over all experience they offer is highly desired, the fifteen tables and fifty seats are booked at least a year in advance and each year hundreds of thousand of people try to book a table. When Farran Adria isn’t spending his time at El Bulli, which is only open during summer, he is at el Taller – the Workshop, where he and his co workers and chemists experiments with new ways to present taste. Heston Blumenthal at the The Fat Duck in England also has a scientific approach and has been described as a culinary alchemist for his innovative style of cooking. We also want to emphasise on Branko Lukic from Nonobjekt studio is Paolo Alto, California whom at the moment is working with a book on “design fictions”. By deliberately creating objects that cannot exist – because the material is not yet available, or the business plan, or the manufacturing process, or the infra-structure to support it, or even the human sensibility – it becomes possible to explore the meaning of design at a more profound level and to think more richly about what is and what might be. Branko Lukic says; “I’m trying to make objects that will touch people.” His idea is to put the soul back into technology, to imbue products with love and emotion. Here within lies a great challenge for designers around the globe. To work with and develop human connectivity and make products and services more sensual at the same time as pushing the boundaries for rational values such as function, material and technology. When it comes to design to break boundaries also means to design new processes and new ways for people to buy less goods (because the world cannot take it any longer). Swedish designer Marie Nilsson asks for new ways to consume design in her Master Project at Industrial Design in Lund; “Create products, services and systems that encourage sharing. Question the traditional approach of buying and private owning and see the possibilities of collective owning, leasing and lending”. Marie talks about breaking patterns. A challenge that really demands an effort, because we are deeply imprinted by material things and many build their identities around the latest car or cell phone. And not to mention clothes, the fashion industry fights hard to make us change our entire wardrobes at least twice a year. What about the phenomena, that David Report named Vulgarism, that lives in the claimed boundary country between art and design? Is that too an example of BREAKING BOUNDARIES and a way forward for the design community, or is it a dark alley? According to us design and art plays on entirely different levels. Where art poses questions design provides answers. Real art is not made to please the market, it’s questioning and have its own identity and authenticity. Design on the other hand is there to solve a problem for someone. This is a fundamental difference. Many are the designers who dream of being artists (money, fame and status appeals). Despite what one may think of this, but they should at least be given due credit for injecting creativity into a guild that is too often caught in a crippling corporate trap. Too much design suffers too big of a lack of fantasy, curiosity and courage. What is good design? Who decides what good design is and what types of products, processes and services may our five key trends lead to in the future? According to us, good design is a clever solution to a problem. To reach there you must be open-minded and open-hearted. Unite the past, present and future and be inspired from the world around you. Design is about humans. Always. That’s why it has to be culturally connected. We are not machines. You always have to see design through the lens of humanity. 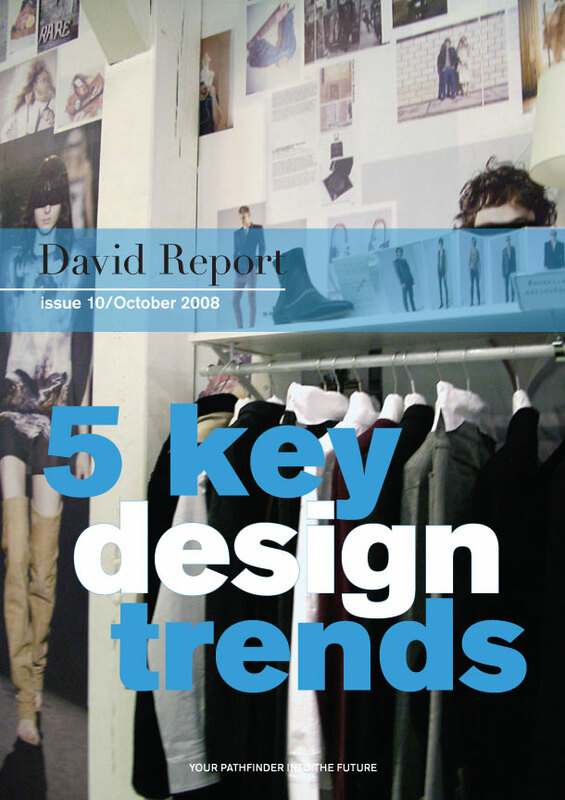 David Report is an influential blog and online magazine that since 2006 writes about trends in the intersection of design, culture and business. Our readers share our interest and curiosity in everything from art, architecture, culture, design and fashion to food, innovation, music, sustainability and travel. David Carlson is a design entrepreneur, facilitator, advisor and holistic thinker. Internationally sought after as a speaker at conferences, seminars, schools, and corporate events, David tells stories in an informed and inspiring manner about his holistic approach at the intersection of design, culture, and business. Recently, his assignments took him to USA, UK, France, Japan, Iceland, Chile, Holland, Slovenia, Taiwan, Switzerland, Germany, Denmark, Norway, Austria, Mexico, Bulgaria and Sweden. His lectures and master classes are regularly transformed into creative ideation workshops. David is the founder of the blog and online magazine The David Report, the Designboost conference series, the lifestyle shop Carlson Ahnell, and the furniture and fashion brand David Design. His social life reflects his cross-pollinating mindcast: president of a nature conservation organisation; guitar player in bands since the early 80s, most recently with the band Miller Moon; and last but not least, a deeply dedicated gardener – more specifically, of old roses with unmatched aromas. You can experience our knowledge in the intersection of design, culture and commercial life live. You and your team will be able to experience our acclaimed culturally-connected trend insight and multi-disciplinary design thinking based on our in-depth trend reports. Do you want to know more about our services? Drop us a mail at info(at)davidreport(dot)com. We offer you to bring your message to an influential audience in a global community of opinion-makers including designers, marketers, industry executives, creative entrepreneurs and people in the know. We have banners in the right hand column and also sometimes at the very top of the page. You can also put an ad in our in-depth online trend report – the flip through version, the pdf version and the plain text version of the upcoming issue. The information will be permanently present in that issue, of course. For rates and more information about advertising opportunities, please send an e-mail to info(at)davidreport(dot)com. © 2010 David Report. All Rights Reserved.